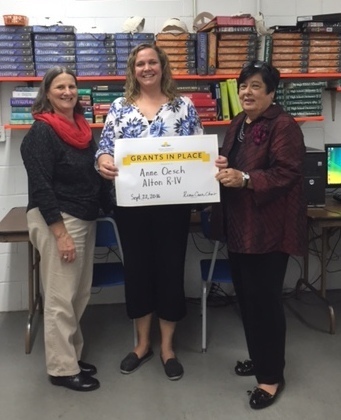 Anne Oesch, Alton High School speech and drama coach, received a Grants In Place award from Carol Silvey, Rural Schools Collaborative board member and Community Foundation of the Ozarks senior associate for advancement (right) and Dr. Jane Dethrow-Ward, 2016 Rural Education Fellow and Missouri State University - West Plains faculty member (left). Mrs. Oesch's project received $3,000 from a Community Foundation of the Ozarks' Rural Schools Partnership grant for a Greek Amphitheater and Readers Theater Project. A Greek theater is the broader project to be built at the city park, adjacent to the school. This grant will be utilized to start land preparation at the park, sculpting the seating, stage work and native stone retaining walls. Congratulations to Mrs. Oesch. The school and community look forward to the addition of this theater.